The mission of Garden Cycles LLC is to control invasive plants and restore native plant communities – while minimizing our carbon footprint. 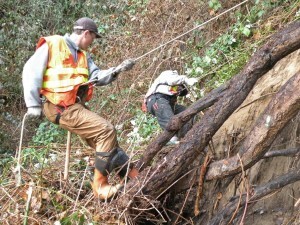 Most of our work is for municipalities in urban forests. However, we enjoy helping homeowners in backyard natural areas, stabilizing slopes with native vegetation, and transforming lawns to wildlife habitat. Note: The photograph above was taken in the early days of restoration, when government contracts required manual, off-site removal of invasive plants, resulting in obvious erosion and the inevitable regrowth of invasives from root fragments (Himalayan blackberry in this case). “Best practices” have since evolved, and we now mulchcut blackberry, then cut and treat stems with herbicide to leave decaying roots in the soil and stems on top, retaining the soil sponge and fungal filter for stormwater runoff, the number one polluter of Puget Sound. We further prevent erosion by applying erosion-control fabrics and replanting deeper-rooted native plants.